With the launch of the iPhone 5, Apple introduced the Lightning connector, designed to address deficiencies of previous connectors, considering multiple factors such as meeting consumer demand for ultra-slim form factors. The new connector was surrounded by mystery, as there wasn’t too much public information about except that it’s small and reversible. A later teardown of the Lightning connector revealed that it houses a built-in authentication chip, which enables Apple to fight counterfeit connectors with a simple software update — in case the company moves to strengthen its grip on accessory makers. 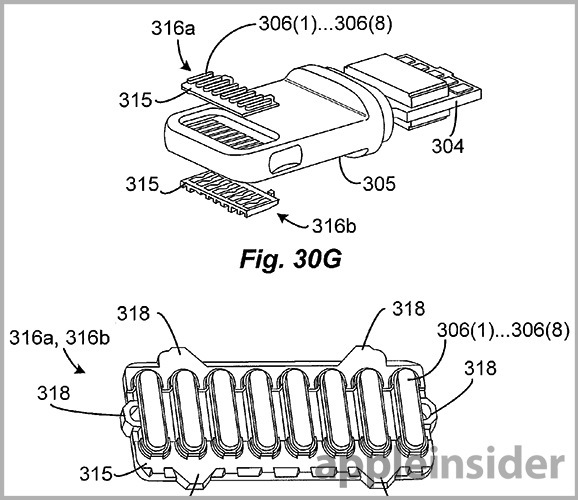 Three new patents filed with the US Patent and Trademark Office on Thursday (discovered by AppleInsider) shed more light on how the Lightning connector really works. One of the patents, for a “Dual orientation connector with external contacts and a conductive frame” details the connector’s hardware design, build and proposed functionality. Contacts on the connector include a ground, multiple data signal pins and ID pins to denote orientation. The problem with creating an orientation agnostic design is how to facilitate the identification of each pin on the connector. To solve this dilemma, Apple disposed an ID module that is operatively coupled to the pin contact on the device side. In one embodiment, the invention calls for a set of rules regarding the location of data signal pins and ground contacts, with the positioning either mirrored on both sides of the tab, or disposed opposite each other. The wiring within the tab, which is consequently associated with the correct pinout, connects contacts on one side of the tab with its partner contact on the opposite side. However, it should be pointed out that two contacts, accessory ID and accessory power, are located kitty-corner to each other on opposing sides of the tab. This configuration allows for the dual orientation compatibility seen in Lightning. The other two patents are both entitled, “Techniques for configuring contacts for a connector” and detail the dynamic assignment of pins on the connector by a host-side identification system, describing the host and accessory systems needed for dynamically assigning pins a certain role. According to the patent language, in one embodiment the contacts are configured by first detecting the mating of two conncectors. In response, the host unit sends a command through two host-side contacts and, depending on which returns a valid response is received, determines the orientation of the connector. Apple’s Lightning hardware patent credits Albert J. Golko, Eric S. Jol, Mathias W. Schmidt and Jeffrey J. Terlizzi as inventors, and it was originally filed in November, 2012. The other two patents, detailing dynamic assignment process, are credited to Jeffrey Terlizzi, Scott Mullins, Alexei Kosut, and Jahan Minoo as their inventors, and were filed in November and December respectively last year.